MRS-4524 Vari-Gloss 2.1 V.O.C. 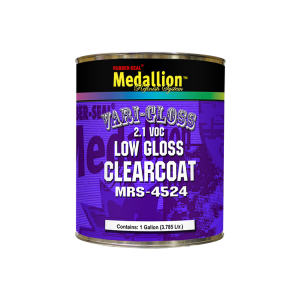 Low Gloss Clearcoat is an acrylic urethane clearcoat formulated for multiple gloss levels depending on the mix ratio. It can be used for undersides of hoods, door jambs, backsides of fenders and quarter panels. MRS-4524 has excellent UV resistance and can be used on exterior panels. When mixed 5:1 with MRS-4525-Q activator, MRS-4524 matches OEM matte finishes. Available in quarts and gallons.